This is a modified version of a Self Magazine recipe. It turned out amazing. Instead of roasting in an oven I used the slow cooker. 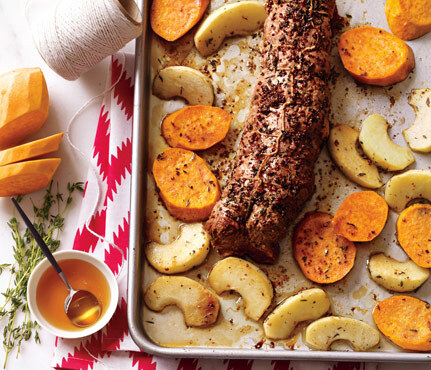 The pork tenderloin was super tender and the combination of spices, sweet potatoes and apples was perfect. For around $15, you can get about 6 servings. We added a side of green beans. Also, if you don’t already use slow cooker liners, you need to start. They are awesome. Place slow cooker liner inside slow cooker. Pour in water. Rinse off pork tenderloin and place inside slow cooker. Add olive oil, thyme, salt, pepper, syrup, and whole-grain Dijon mustard. Stir. Add sweet potatoes and apples and let cook for 1 hour. When I added the potatoes and apples I put the slow cooker on high. Once the potatoes and apples become tender, put the slow cooker on warm until you are ready to serve.